The evolution of Valentine’s Day began at the end of the 5th Century when the Catholic Pope, Gelasius, outlawed the pagan feast, Lupercalia, in favor of a religious feast honoring the martyred, St. Valentine, also known as Valentinus. There were at least two St. Valentine saints, maybe even three, all martyred for humanitarian deeds that were against the edicts of the Roman emperor of the moment. 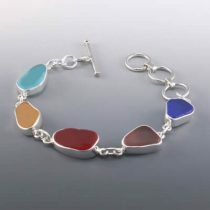 Nothing says “I love you,” more than a carefully and thoughtfully chosen gift of sea glass jewelry. 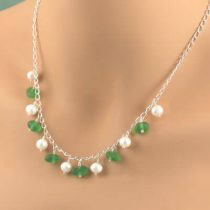 Presenting your loved one with a gift that is both timeless and unique shows her just how much you really care. 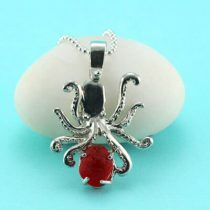 One of our exclusive designs, this whimsical style is one of our best selling necklaces. 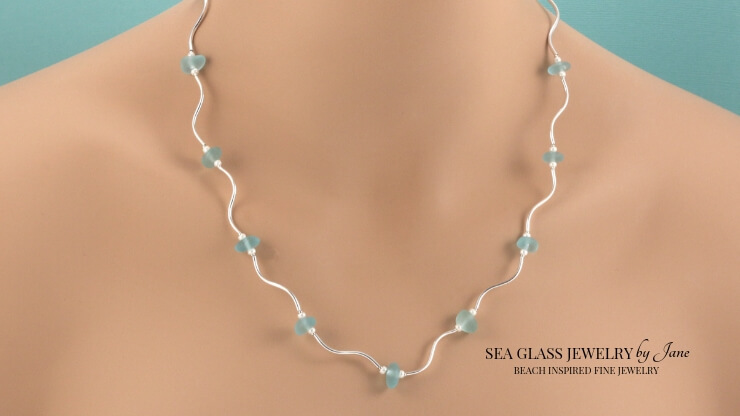 The bright aqua sea glass designer necklace is composed with sterling silver curved tubes that are connected to small, roundish genuine aqua sea glass jewelry gems and tiny white glass beads. 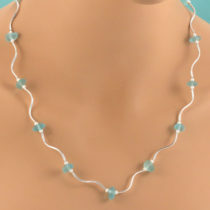 Nicknamed, the “wavy necklace” it is light and easy to wear and fastened with a toggle clasp. Lots of determination, time, sorting of sea glass sizes and shapes make this one a labor of love made for someone deserving of lots of love! 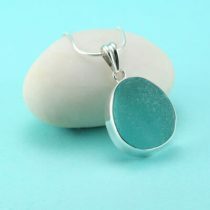 Aqua is the color of loyalty, caring, tranquility and life force. 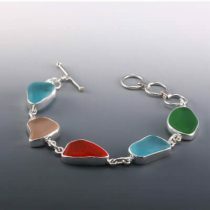 Giving a gift of rare, aqua sea glass jewelry is a special way to express your true feelings for your Valentine. 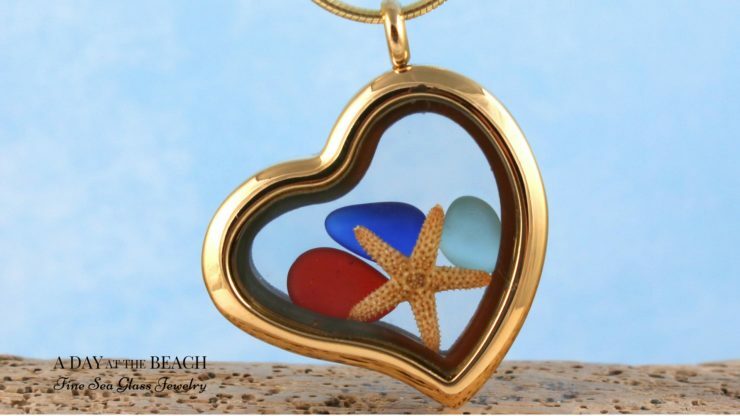 Carry the beach with you every day when you wear your heart-shaped sea glass pendant, floating locket in a beautiful gold finish! 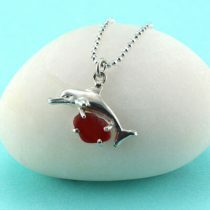 The locket is filled with a mini starfish and three genuine sea glass gems, rare cherry red, cobalt blue and aqua! It is sturdy stainless steel with a gold finish, very well made with a strong magnetic clasp on one side that opens and closes so you can add your own tiny treasures, even a little (clean) sand from your favorite beach! 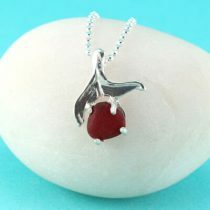 Giving a sea glass jewelry gift that is both heart shaped and contains rare, red sea glass is guaranteed to please your sea glass lover. 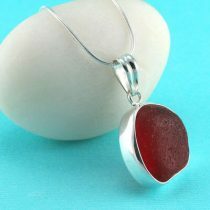 Our sea glass lockets are offered in gold, silver and rose gold hues. 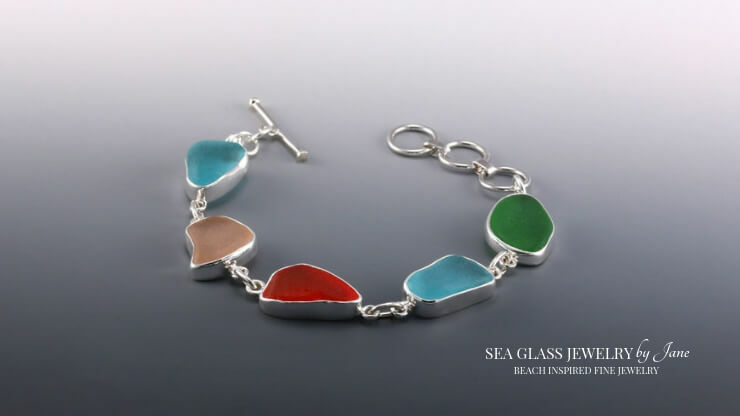 A one of a kind sea glass bracelet, this 5 piece, rarest colors sea glass bracelet is destined to be a once in a lifetime treat for the sea glass lover. 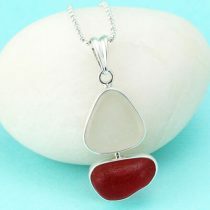 The focal sea glass is an extremely rare bright red sea glass and it is flanked by rare pink, aquas and green hues, all bezel set in sterling silver and adjustable in size with the toggle clasp. 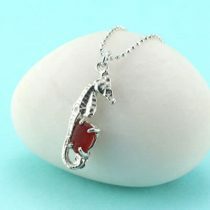 And since red is the color of love, you’ll want to take a look at all of our sea glass jewelry designs made with this romantic color! 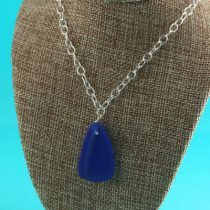 A gift of sea glass jewelry, lovingly hand made and the only one of its kind, shows her that she is like no other.